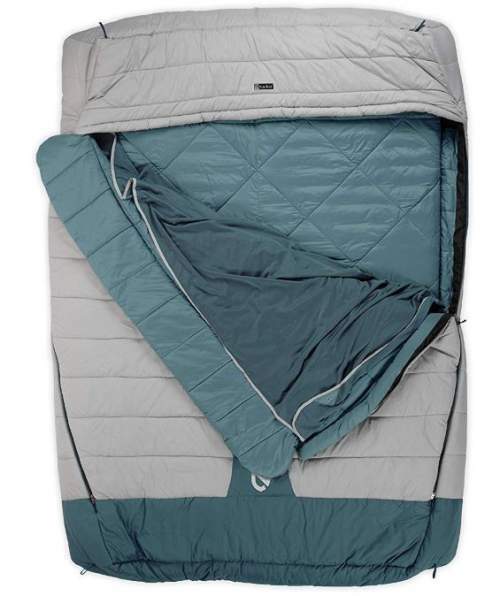 Nemo Jazz Duo 20-Degree Sleeping Bag is an incredibly roomy and comfortable 3-season bag for couples or for solo car camping, with integrated sleeves for a pad and an oversized hood. Nemo Jazz Duo Sleeping Bag. 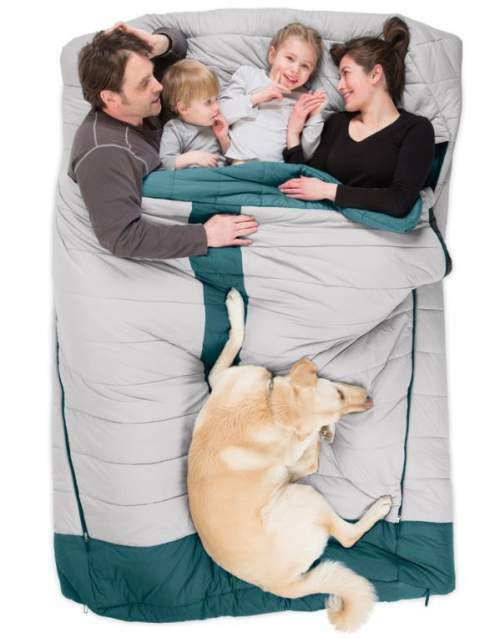 This sleeping bag is available on Amazon. The shipping conditions which they offer are usually the best, they have stores on 5 continents. The Jazz series is new from Nemo, they launched 4 different sizes. This includes two double bags, this Nemo Duo presented here and Nemo Duo Long (Luxury), and two single bags, the Nemo Jaz Luxury, and Nemo Jaz Standard. Obviously, the design is the same in all of them, but there are differences in the sizes and consequently in the weight and in the packed size. The picture below shows you the basic dimension differences between the two double bags. The duo bags regular and long (luxury) versions. 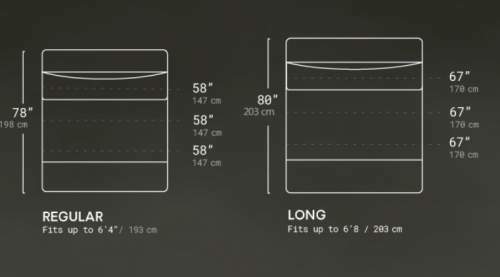 This is a rectangular type as you realize from the pictures, so the girth is the same all along the bag, you will see the numbers in the specifications below. But it is still a bit tapered geometry that cuts excess volume at head and foot, which a bit increases its overall insulating efficiency. The ’20-Degree’ in the name tells you the temperature rating for this series, and it is quite impressive 20 F (-7 C). Note that some brands have the EN rating for their bags, but this is not compulsory, and you do not have it here. In any case, the feeling of cold is very individual, so to be sure about the comfort, it is always best to add some 5 – 10 degrees to the declared rating. Seasons-wise, with the given temperature rating I would say this is a great 3-season bag and perhaps a bit more than that. But bear in mind that the narrow (mummy style) bags are more temperature-effective because of the less volume in the bag. Weight-wise, with its 7 lb 9 oz (3.42 kg) of weight, this is clearly a camping item. If you need something to carry on the trail, better check some other models by Nemo, like Nemo Tango Duo which you will see in the list if you follow the link. Size-wise, you have already seen above, this is a bag for two (at least) but if you feel claustrophobic like me in standard single bags, this can be used as a solo bag for car camping. This is what I do when I sleep in the car or do car camping in the Alps. The picture below gives you some idea about its size. Quite some space for a family. The packed size is not so great but this does not matter for a camping item, the dimensions are 31 x 14 x 14 inches (79 x 36 x 36 cm), see the picture below which shows you the sleeping bag packed in its carry bag. You will be able to compare it with some other models, there is a comparison table below. The duffel carry bag is large enough to pack the pad together with the bag. Full length zippers are on both sides so each of the partners can use them independently. You can unzip them completely and use only the (removable) sheet which you have there. The oversized hood is big enough for two pillows, and when it is cold you will use the Blanket Fold draft collar (visible in the picture below) to prevent any draft under the chin. The inner is a quilted pillowtop that adds to the comfort and gives a bit of insulation, see the picture. The integrated sheet and the pillowtop inner area of the bag. The bag comes with the mentioned sheet which you see in the picture above, it is fixed with snap buttons to the bag. So you can remove it and wash. Those snaps come undone too easy, pity they did not use zippers or toggles. I am not the only one who noticed this, have seen people complaining about this. Underneath the bag, you have sleeves for a 50 inches sleeping pad or two pads 25 inches each, see the picture below. This is a good design because pads in the sleeve will keep the bag in place when you twist and turn at night and you will not slide off the pad. 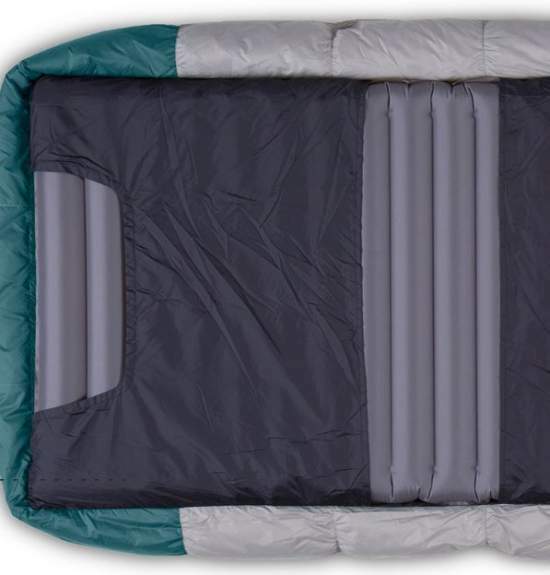 For example, here you can use this Therm-a-Rest NeoAir Camper Duo Sleeping Pad or two Klymit Static V Sleeping Pads. This is how you fit a pad into the sleeves. But note that you can use any wider pad as well, it does not have to fit into the sleeves. This will give you an even better sleeping surface. There are many great options in my page with sleeping pads. Yet another great feature is that you can keep the sleeping pad in place when you pack the bag, just deflate the pad and roll it up together with the bag. This is what they call the Grab-and-Go design. The shell is 40D nylon ripstop constructed from high tensile yarns and with a DWR finish on the face to prevent moisture absorption. The lining is 30D nylon taffeta with DWR. The insulation is what they call Synthetic Stratofiber for a moisture-resistant warmth in all conditions. This Stratofiber is NEMO’s own type of polyester staple fibers insulation which is optimized for a balance of warmth and loft. You have 4 lb 1 oz (1.85 kg) of the insulation alone in this bag. The sheet does come undone easily. Type: double-wide rectangular sleeping bag. Weight: 7 lb 9 oz (3.42 kg). Temperature rating: 20 F (-7 C). Packed size: 31 x 14 x 14 in (79 x 36 x 36 cm). Fill weight: 4 lb 1 oz (1.85 kg). Fit: up to 6’4″ (193 cm). – Shoulders: 132 in (335 cm). – Hips: 132 in (335 cm). – Knees: 132 in (335 cm). *Note, the numbers are for the Double Pad Standard. I have decided to show you this Jazz Duo bag side by side with two items from some other top brands. This might help in making the right decision. The Kelty’s bag is with the same temperature rating and it is far more affordable. The Sierra Designs’ bag is not as warm as the other two, and this is a quite different design, but it is only half the price of the Nemo’s bag. Please follow the links for more details. 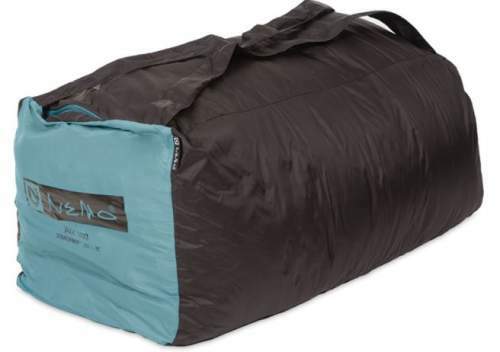 So this Nemo Jazz Duo 20-Degree Sleeping Bag is built to rival the comfort of your home bed and if you have enough of those narrow claustrophobic sleeping bags, this is the item to try. It will take some space in the car trunk, and this would be an investment, but I am sure it is worth it. The bag is big, comfortable, and warm, more you do not need in the camp. 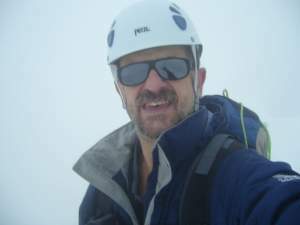 Please check my page with sleeping bags if you need more options to check. There are many in various sizes and shapes, and for all seasons, described in detail. You might want to know that this is not a sponsored text, and I am not paid by brand. Do let me know if you have any question or comment, there is a comment box below.